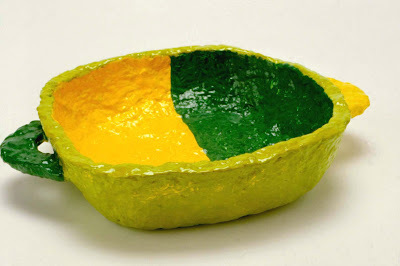 The children construct and design bowls using papier mâché pulp and paint. For ages 9 to 13. Plan 4 to 5 sessions. 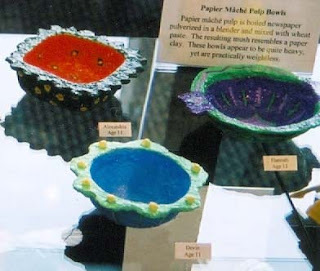 Note: To prepare papier mâché pulp, rip newspapers into roughly 1-inch pieces, cover with water, bring to a boil, and simmer for an hour. Turn off the heat and let sit overnight. Put wet newspaper and water into a blender in small batches to make a mash. Squeeze out excess water. Mix some wheat paste to a very thick consistency. With your hands, blend enough of the wheat paste into the newspaper mash to produce pulp the consistency of stiff mashed potatoes. Two full sheets of newspaper, approximately 23 x 27 inches, will make enough pulp for about one 16-ounce bowl. Store in a refrigerator. Prepare the papier mâché pulp. Set out the pulp, petroleum jelly with brushes, plastic wrap, and masking tape. Set out molds, planning one for each child. 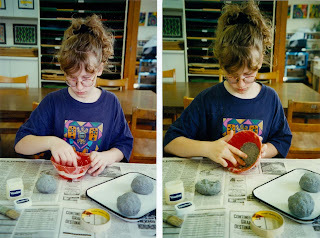 Explain to the children that in this session they will be constructing and designing bowls using papier mâché pulp—a clay-like medium made from newspaper and paste. 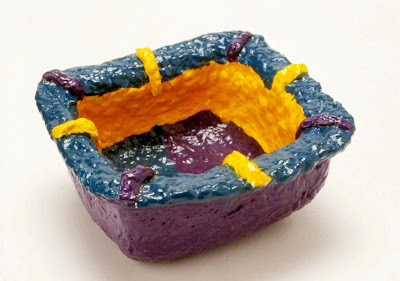 The pulp is put into a mold to form the foundation of the bowl. When dry, it is taken out of the mold and the shape is modified with additional pulp. Show the children how to prepare the mold so that the dried pulp will not stick to it. First apply a thin coating of petroleum jelly to the inside of the mold. Then line it with plastic wrap smoothing out the wrinkles as much as possible. The petroleum jelly will help the plastic wrap cling to the mold. For ease of working, tape the loose ends of the plastic wrap against the outside of the mold. The bowl is formed by gradually lining the inside of the mold with a quarter-inch to a half-inch of pulp. Be sure all areas are evenly covered to avoid weak spots in the finished bowl. Smooth the pulp and the lip, or top edge, of the bowl before allowing it to dry. Have the children prepare their molds and line them with pulp, finishing the edges carefully. Note: Dry the bowls in a warm place. You can speed the drying process by lifting the hardened bowls from the molds and setting them upside down. This will help the bottoms to dry thoroughly. Set out papier mâché pulp and the dried bowls. Set out cardboard, scissors, liquid glue, and masking tape. Explain that in this session the children will be using cardboard and pulp to change the shapes of their bowls. Show the children how shapes, such as pedestals, brims, or handles, can be cut from cardboard and attached with small dots of glue and tape. Cover these additions with a thin layer of pulp, being careful to follow the contours of the shapes. Be sure to cover the tape as well. Wet pulp can also be pinched into designs and added to the dried pulp with a dab of liquid glue. Have the children use cardboard and fresh pulp to change the shapes of their bowls. Remind them to smooth the pulp before letting the bowls dry. Set out gesso, brushes, and small pieces of sandpaper. Explain to the children that in this session they will be applying gesso, a plaster-like preparation, to their bowls. This will make the surface of the bowls smoother and easier to paint. Before applying the gesso, use sandpaper to smooth any sharp edges that may have formed in the pulp as it dried. 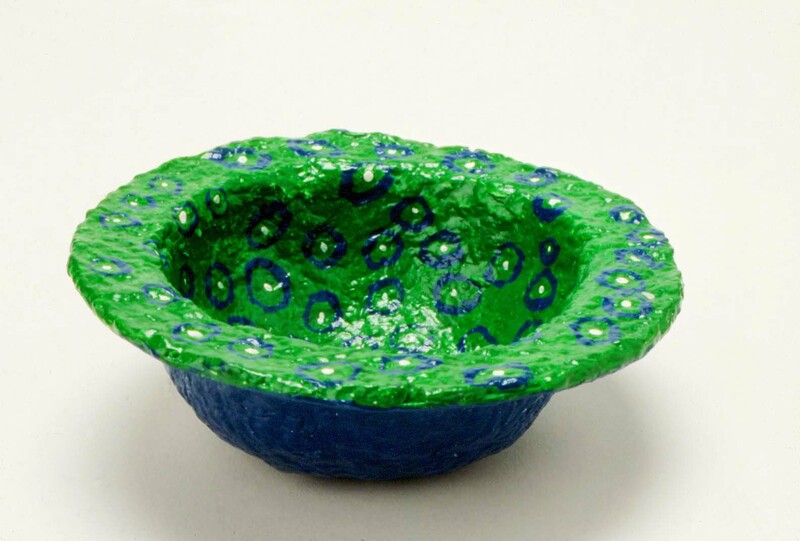 Show the children how to paint on a three-dimensional surface. Fill the brush with gesso and dab into any rough areas. Brush away any puddles. Only one coat is needed. 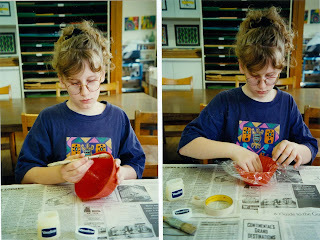 Have the children smooth the sharp edges and paint their bowls with gesso. If time permits, the children should begin planning the colors and designs that they will use for painting their bowls in the next session. Set out dried bowls, tempera paints, brushes, and containers with lids for mixed paints. Set out containers of water and sponges. In this session, the children will be painting a first layer of paint on their bowls. In the next session they will be adding details. Encourage the children to mix colors to create either coordinating (harmonizing) or contrasting (opposite) color schemes. Explain that the designs for the outside of the bowls should be different from the inside, and that it is important that the designs work together as a whole. Warn the children that when mixing their colors, they should make enough to cover the surface of their bowls. These colors can be stored in small jars for repairing mistakes that may occur and for sharing with other children. Remind the children to fill their brushes with paint and dab into any rough areas. Be sure they understand to brush away any puddles of paint which might chip off when dry. Have the children mix their colors, and then cover the entire surface of their bowls with the first layer of paint. Let the bowls dry before painting on the details in the last session. Preparing the pulp for this lesson is time-consuming, but the five sessions for the project are not complicated and the results are consistently successful. 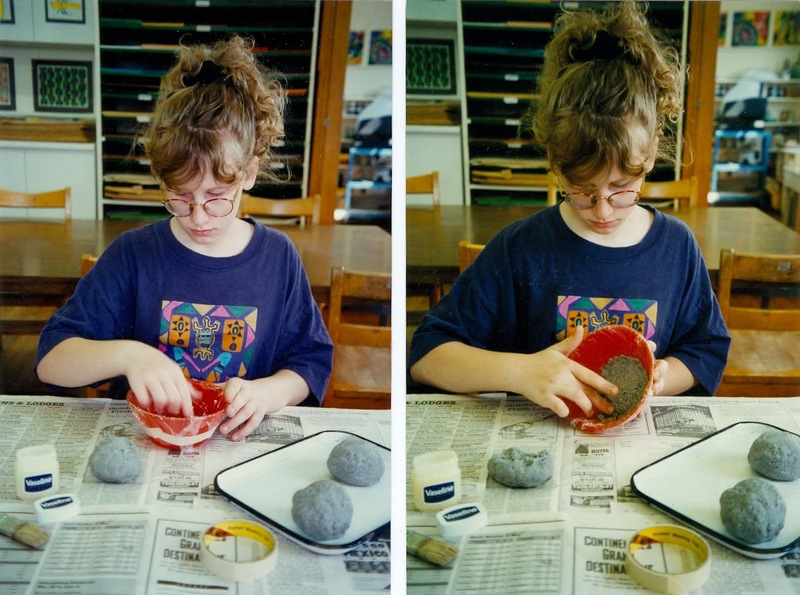 Even though the children start with a molded shape, there is plenty of opportunity for creative thinking by changing the shape and designing the surface of the bowl. In the case of allergies, white liquid glue can be substituted for the wheat paste. 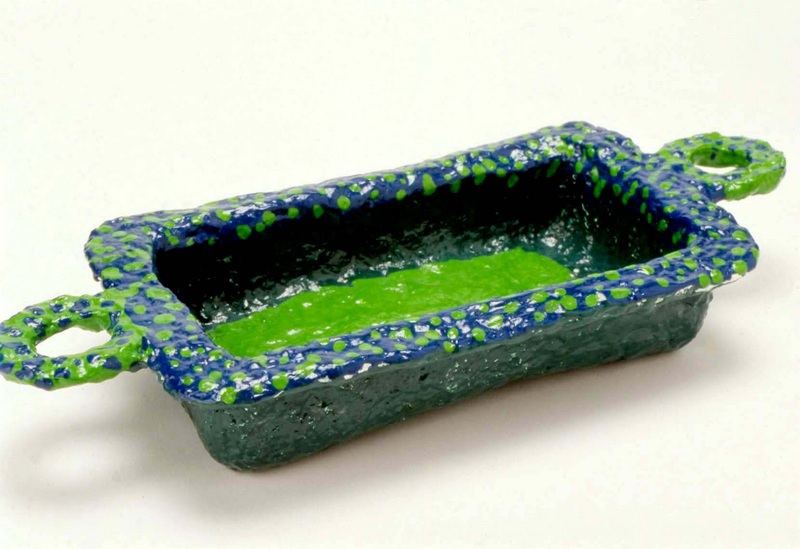 Applying petroleum jelly to the mold will release the dried pulp, but leaves a greasy surface. Using plastic wrap can be awkward for small hands to manage. The combination of petroleum jelly and plastic wrap works well. Use wadded strips of aluminum foil to support freshly painted bowls which are still wet on the bottom. Are the bowls sturdy with even thickness? 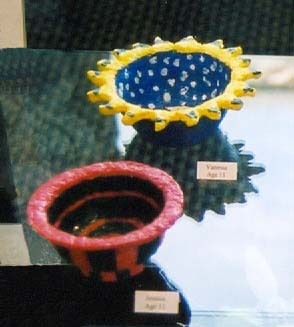 Discuss how the molded foundations of the bowls have been changed. Have the bowls been painted in a carefully planned manner? Oops. I put pulp on my bowl and now the tape won't stick. I used a lot of tape. Why do I have to cover it with pulp? Won't the paint cover it? Papier mâché pulp is harder to paint than I thought. I dripped yellow paint where I don't want it. I painted the top and bottom of my bowl. How can I set it down? Remember to do all of your taping before applying the wet pulp. If you forgot, sometimes the quick drying glue will hold your cardboard in place. Otherwise, you will need to make your changes with the pulp. Cover all additions, including the tape, with a thin layer of pulp so that all the areas of your finished bowl will have the same texture. When painting on the papier mâché pulp, sometimes you have to dab into the rough areas to get the paint to cover. Be sure to brush away any puddles. If you dripped a color on an area where it's not suppose to be, you can let it dry and then use your saved paint to cover it up. You might also consider turning it into part of your design. If both sides of your bowl are wet, we can support it on strips of wadded aluminum foil until it dries.